50 chaplains of law-enforcements from the Tri-State area were gathered by Misaskim. Misaskim has brought together, for the first time, more then 50 law-enforcement chaplains from the Tri-State area. The rabbis who serve in over 45 law enforcement agencies, including military and penal institutions, welcomed the evening of collaboration. "It was truly a Kiddush Hashem and a great networking opportunity," said Rabbi Luzer Weiss, chaplain at Lincoln Correctional Facility and director of N.Y.S. Dept of Agriculture Kosher Law Enforcement. The objective of the evening was to establish a coordinated group of orthodox chaplains, so that members can become acquainted and reach out to their colleagues in times of need. In addition, the chaplains agreed to share information among themselves about the variety of services available to the respective agencies each serves. Most important, however, was the opportunity this gathering offered to the chaplains to share ideas and concepts that will lead to further improvement of the vital services each offers to the communities they watch over. 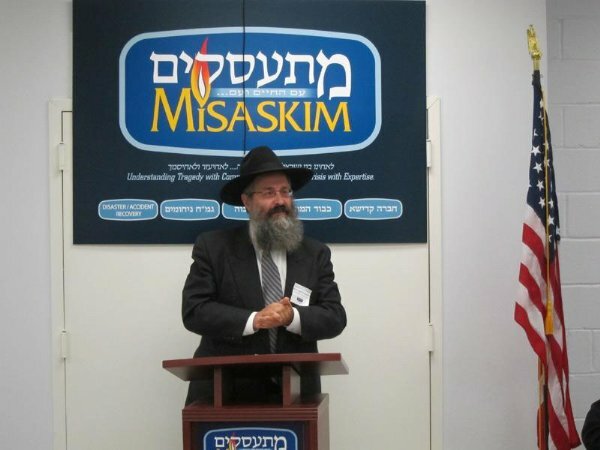 Rabbi Menashe Miller, Mayor of Lakewood and chaplain in the U.S. Air Force, was the first to address the group. He impressed upon his fellow chaplains that in addition to serving their specific communities, chaplains are required to have a great deal of sensitivity when dealing with the law-enforcement community. "There's a certain level of sensitivity that you have to have for each and every individual constituent in your town, municipality, or county," Rabbi Miller said. He then stressed that this understanding must be extended to the agencies the chaplains represent. Chief Robert Lawson of Lakewood, N.J., who was also present, shared law-enforcements' view regarding working together with agencies. He outlined the multiple duties chaplains must fulfill, emphasizing the vital support they offer to men and woman in law-enforcement service. "When an officer is dealing with a situation on the street, he can pick up the phone and say, "Rabbi, I have this situation. Can you help me solve this problem?'" Chief Lawson explained. Rabbi Arye Leib Glanz, chaplain of the Greene County Sheriff’s Department and a former chaplain with the NYC Department of Corrections, outlined the tremendous responsibilities associated with the position of chaplaincy. "It's not about the photo ops," he quipped. Rabbi Glanz warned fellow colleagues about the serious consequences that may result from overstepping one’s boundaries and interfering with the legal system — even when chaplain’s intention is to ease the pain of an incarcerated individual. Rabbi Yosef Carlebach, chaplain of the NJ State Police and NJ Transit Police, Director of Chabad House at Rutgers University and Chabad Activities in central and south New Jersey, succinctly stated the crucial role chaplains carry out each day. "As chaplains you represent two different worlds," he stated. "You represent authority to the people and you represent the people to the authorities." Chief Chris Trucillo, former Chief of the Port Authority of NY and NJ Police and current chief of the NJ Transit Police, discussed the sensitivities involved in dealing with families and officers during times of tragedy and death. He thanked the chaplains for their assistance after the 9/11 attacks. "Each time I went [to do a death notification] I had the benefit of going with one of you," Chief Trucillo told the chaplains. "And that mattered greatly." He went on to say, "Never underestimate how critical the job you do is to the police department." Also present were Army Reserve chaplain Col. Jacob Goldstein and Rabbi Benzion Chanowitz, director of Landfield Avenue Synagogue - Chabad in Monticello, NY. Dinner was wrapped up with a question and answer session during which the chaplains discussed some of the challenges that they and the communities that they serve face each day. Several new initiatives were proposed and discussed, and the ground work for a crucial network was established that evening.